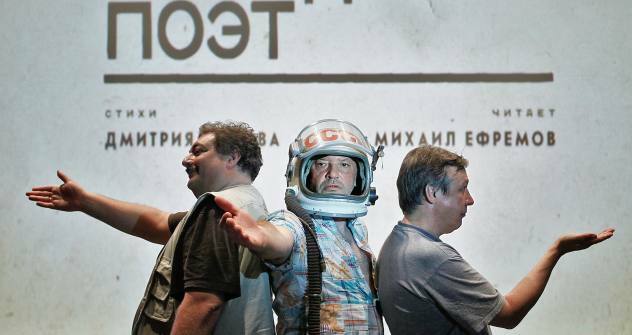 The “Citizen Poet” project revived the Russian tradition of satirizing the powerful. Russia was a different country when, a year ago, the first episode of “Citizen Poet” was broadcasted on the independent, mainly Internet-broadcast, channel "Dozhd" (Rain). There was the actor Mikhail Yefremov, arms crossed, dressed in 19th-century style and sporting a pince-nez, while in the background a crumpled poster of poet Nikolai Nekrasov, whom he was imitating, hung on the wall. It was the birth of "Citizen Poet." In just a few hours, the video became the most popular link on the Russian Internet. The program has three creators: 44-year-old Dmitri Bykov, writer and bitingly humorous columnist for the Moscow periodicals, writes the verses; they are recited by actor Mikhail Yefremov, 48, known in Moscow circles as an inveterate opposition figure and not one to back away from any scandal; and the producer is 54-year-old Andrei Vasiliev, long-time editor-in-chief of the independent daily Kommersant. The three enjoyed almost universal approval of their program: Russians had been sorely deprived of satire about the Putin regime. For well-known journalist Yury Saprykin, “Citizen Poet” was the last refuge of the opposition. Emasculated by the ruling elite, the opposition could now make fun of them. Others saw in the program a continuation of the series “Kukly” (Puppets) which made fund of politicians and oligarchs from 1994 until it was cancelled in 2002. Bykov, Yefremov and Vasiliev have remained faithful to their tried-and-true concept for 48 episodes. Yefremov has imitated poets from Kornei Chukovsky to Edgar Allan Poe. Bykov reworks current events into effervescent word acrobatics, whether it’s the ban on gherkin imports from the EU or Prime Minister Vladimir Putin’s refusal to take part in TV debates with the other presidential candidates. However, Dozhd did not remain true to the format. Following the sixth episode – a Putin polemic against Medvedev – the views of artists and broadcasters parted on what satire should do. But the fight just made the program more popular. Radio station Ekho Moskvy and online portal F5 took over the project, and now each new episode is seen by hundreds of thousands each week. After several performances in Moscow, the team went on a tour of the regions last fall and promptly came in for some harsh criticism when it became known that they were being sponsored by oligarch and presidential challenger Mikhail Prokhorov. Bykov went on the offensive in a newspaper article: "Who gave the orders? Who pays you? Not the Kremlin by any chance?" He started hearing it everywhere. For him it was symptomatic of a sick society, one created by Putin’s regime. "Who gave you the right," we’re asked. Our response: "No one. We didn’t ask!" And it was precisely to disrupt this ingrained mental attitude of passivity and cynicism that they set out through the country. People aren’t really getting anything new from Yefremov and Bykov. The authors are only playing with facts that are already known to those who want to know them, whether it’s the illegal conviction of Mikhail Khodorkovsky, the differences of opinion between Putin and Medvedev or the possible spread of the Arab Spring to Russia. “Citizen Poet” speaks more about what the man on the street currently feels. For 12 long years, the state media have presented Vladimir Putin to the people as an icon. Bykov’s poems are like an antidote to this. In episode after episode, they work towards undermining the sanctity of the regime, removing Putin from his throne, as well as President Dmitry Medvedev, intelligence agents, prosecutors and judges. “Citizen Poet” says that it is necessary to laugh about the most powerful figures in the country. With this in mind, Bykov, Yefremov and Vasiliev paved the way for the protests of recent months. From the Internet, radio and theaters, people are now bringing the message to the streets the message that no one is sacrosanct, not even Vladimir Putin. “Citizen Poet” made its last appearance in Moscow on March 5 , one day after the presidential elections. "There’ll be another reality after that, one for which we’ll need a new project," said Bykov, before the final performance.